The Holy Father, Pope Francis, has this morning appointed the Most Reverend Brendan Kelly, Bishop of Achonry, as the new Bishop of Galway, Kilmacduagh and Kilfenora. It is planned that Bishop Brendan’s installation will take place in the Cathedral of Our Lady Assumed into Heaven and Saint Nicholas on 11 February 2018, the Feast of Our Lady of Lourdes. The position has been vacant for 16 months following the resignation of Bishop Martin Drennan. Born in Derrybrien in the parish of Ballinakill, Co Galway on 20 May 1946 to Sean and Annie Kelly, Bishop Brendan was the second of nine children. He attended Craughwell National School and subsequently boarded at Saint Mary’s Diocesan College in Galway city. Following the completion of his Leaving Certificate examination in 1964, he applied to and was accepted by the then bishop, Michael Brown, to study for diocesan priesthood in the Diocese of Galway, Kilmacduagh and Kilfenora. He started his studies in Saint Patrick's College, Maynooth in September of that year. As a seminarian Bishop Brendan completed a Bachelor of Arts Degree in 1967 and a Bachelor of Divinity Degree in 1970. He was ordained to the priesthood on 20 June 1971 by Bishop Brown in the Cathedral of Our Lady Assumed into Heaven and Saint Nicholas in Galway city. His first appointment was to the parish of Kinvara as a curate before being appointed to the teaching staff of Coláiste Éinde in Salthill in 1972, completing a Higher Diploma in Education in the then University College Galway (now the National University of Ireland, Galway ) in 1973. Bishop Brendan remained on the staff of Coláiste Éinde until 1980 when he was transferred to the teaching staff of Our Lady’s College, Gort, becoming President in 1986.Following the 1995 amalgamation of the three Gort secondary schools, Bishop Brendan applied for and was granted sabbatical leave from his diocese for one year and went to live with the L’Arche Community at Cuise-la-Motte in France. Founded by Jean Vanier in 1964, the worldwide L’Arche movement seeks to create inclusive, creative and caring families where people with and without intellectual disabilities live and work in friendship, joy and mutual respect. Returning to his diocese in 1996, Bishop Brendan was appointed by Bishop James McLoughlin as Parish Priest of Lisdoonvarna in Co Clare and subsequently as Parish Priest of An Spidéal in 2003. 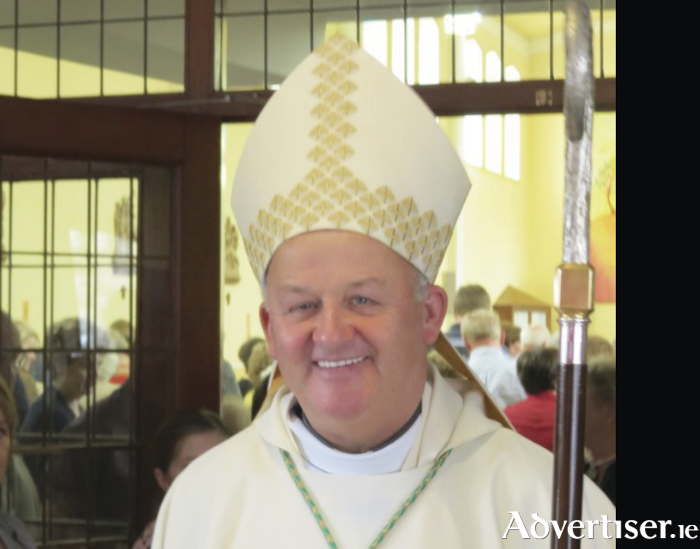 On 20 November 2007, Bishop Brendan was named by Pope Benedict XVI as the Bishop of Achonry, succeeding recently retired Bishop Thomas Flynn. On 27 January 2008 he was ordained to the episcopate by Cardinal Seán Brady in the Cathedral of the Annunciation and Saint Nathy in Ballaghaderreen. In Rome this morning 11 December 2017, Pope Francis, named Bishop Brendan as Bishop of Galway and Kilmacduagh and Apostolic Administrator of Kilfenora, succeeding Bishop Martin Drennan who retired in July 2016. Welcoming the announcement, diocesan administrator Very rev Michael Canon McLoughlin said that they have no doubt that Bishop Kelly will be a good shepherd. “With great joy and with a feeling of some relief, I am honoured and I am proud to say to our new bishop – ceád mile fáilte romhat abhaile arís. “We, the priests and people of these three ancient dioceses, have been through a sixteen-month Advent since the retirement of Bishop Martin Drennan in July 2016. We have been waiting daily in expectation and in hope for white smoke. Now that hope has been fulfilled with news from Rome and we at last can begin preparations to welcome one of our own back home to lead us and to be our shepherd. “We have no doubt that Bishop Brendan will be a good shepherd. The people of Lisdoonvarna and of Spiddal can testify to his compassion and his dedication, to his gentleness and his kindness when he were their priest. Those many pupils he taught in Coláiste Éinde and in Our Lady’s College, Gort will also know of his abilities and commitment both inside and outside the classroom. Although he left us ten years ago for Ballaghaderreen, we watched and regarded him with pride and we always kept him in our prayers. “And now we are very pleased indeed that he has come back to us. We look forward to making him feel welcome and to helping him readjust. We know some of his many talents. Like Bishop Drennan and Bishop McLoughlin before him, he has a passion for the Irish language and for Irish culture. In his work he has always prioritised evangelisation and the wonderful potential of Catholic education. We know from his words in Oranmore last September, when he ordained our newest priest - Fr. Declan Lohan - that fostering and inspiring vocations to the priesthood and the religious life has always been to the fore in everything he says and does. And we know too that he is a man of integrity and of deep faith. These things are important to us, the priests and people of this diocese, too. We look forward, with the help of God and our Blessed Mother, to sharing the journey in the years ahead with our new Bishop. May God bless our work together mar ní neart go cur le chéile ! “On a personal note, as my time as Diocesan Administrator draws to a close, I would like to take this opportunity to thank, with deep gratitude, those many people who have supported me in my work these past sixteen months. I will be forever indebted to our retired bishop, Martin Drennan for his wisdom and unfailing kindness and to all those many people who worked closely with me in the Diocesan Office, in Moycullen, throughout Galway, Kilmacduagh and Kilfenora and beyond. I believe that Bishop Brendan is coming back home to a diocese full of enormous potential and promise and I wish him and pray him bountiful blessings. “When a priest is first ordained, each priest at the ceremony goes at once to him, offers him the kiss of peace and whispers quietly in his ear ‘ad multos annos’, which means ‘to many years’. Bishop Brendan, on my own behalf and on behalf of your priests and your people, from our hearts, we also say ‘ad multos annos’. Having a clear-out? Why not CityBin it? Page generated in 0.1775 seconds.